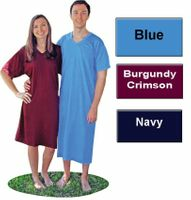 1 - nightshirt/s $39.95 ea. 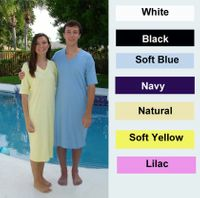 2 - nightshirt/s $37.95 ea. 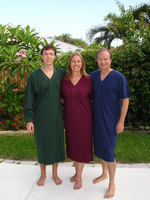 Wittmann Textiles Company Soft and light Men's Woven Cotton Henley Nightshirt that will make any night a more relaxing and comfortable experience. The soft 100% Premium Cotton Percale material is similar fabric to the light weight woven men's dress shirt material (very light and durable) and features a left breast pocket and side seams. Colors: Navy, White or Light Blue. Premium quality made in Turkey or India. Machine wash in cold or warm water and machine dry; ok to use fabric softener, but try to limit bleaching of white color to prevent damage to the light cotton material. 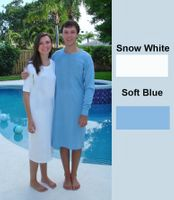 This and the Summer Nightshirt will be our lightest material in a nightshirt. Color Availability note: Size XS - Navy Color only and Size 3XL:Short Sleeve - out of stock. Men 90-120 121-150 151-190 191-230 231-270 271-320 321-370 lbs.